When it comes to "The Cabin in the Woods," there are two kinds of reviewers. There are reviewers who give away the entire plot, and there are reviewers so afraid of ruining the experience they say almost nothing about it. I will say this about "The Cabin in the Woods." It involves a cabin that happens to be in the woods. 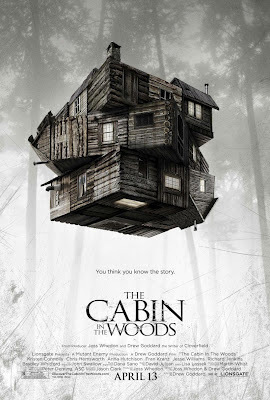 I'll also say this: Even before the movie's title flashes on-screen, it's clear "The Cabin in the Woods" is not your typical horror movie. It gives off a certain vibe. It's a little different. The result is the most entertaining horror movie since San Raimi's "Drag Me to Hell," which in tone and pacing, "The Cabin in the Woods" resembles, if you also crossed it with the first "Scream." Without spoiling the plot, I can say "Cabin" is a fast-paced, funny, quirky horror movie that knowingly plays with the genre's well-worn conventions. If you at all like horror movies, you should see it. If you live and breathe horror movies, this one was made for you. And if you don't like horror movies, you should reevaluate your life choices. Then you should see it. But, fair warning, unless you've seen a couple of "Friday the 13th" or "Nightmare on Elm Street" movies, you'll probably leave the theater wondering what on Earth you just experienced. That is a risk you should take. Now that I've heaped as much advertising-friendly praise on "Cabin" as I can spare, I can't promise I won't mention the plot. The men responsible for "Cabin" are producer/co-writer Joss Whedon ("Firefly") and director/co-writer Drew Goddard ("Lost"), who bring to the proceedings the same genre-subverting approach they honed on Whedon's TV shows "Buffy the Vampire Slayer" and "Angel." Take our cast of characters, for instance. We have the obligatory "good girl" (Kristen Connolly), a jock ("Thor" star Chris Hemsworth), his girlfriend (Anna Hutchison), a brainy guy (Jesse Williams) and a stoner (Fran Kranz). So far, so good. These are the same college-age stereotypes who have run screaming from machete-wielding maniacs since 1978. But the good girl isn't all good, the jock is a bit of a brain, the brain is a jock, the girlfriend isn't a total tramp and the stoner is a bit too wise to play the fool. Why, they're almost like real people. Not to worry. These are minor details, easily corrected so as not to interfere with your viewing enjoyment. By the time our potential corpses meet the creepy old man at the gas station, all is going according to plan. As I said, it's not your typical horror movie. I mean, I can't even really tell you about the two best characters, Sitterson and Hadley, played by Richard Jenkins ("Six Feet Under") and Bradley Whitford ("The West Wing"). To do so would mean giving away more than I, in good conscience, feel comfortable giving away. I will say Sitterson and Hadley get all the best lines, and apart from plot twists that seem to come from out of nowhere, the one thing you should expect from a Joss Whedon production is stiff competition for "best lines." If there is a potential for a weak link here, it's first-time director Goddard, but he maneuvers through the twists and turns like an old hand. And maybe that's because, in a sense, "The Cabin in the Woods" is a movie horror fans have all seen before. Culture Shock: 04.12.12: '80s cartoons strike back — again! Netflix has a section of children's programming it brands "Just for Kids," but pretty soon, I bet, a lot of 30-somethings will be clicking entry to relive part of their bygone youth. Come to Cobra. We have cookies. 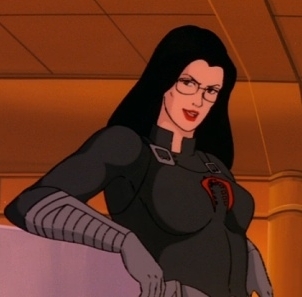 Last week, the video-streaming and DVD-rental service announced a deal with Hasbro to bring new and vintage cartoons based on Hasbro's toy franchises to Netflix's library of "watch instantly" offerings. At the heart of the deal are Hasbro's latest cartoons, some of which are already available on Netflix instant: "Transformers Prime," "G.I. Joe: Renegades" and new versions of "Pound Puppies" and "My Little Pony." New seasons will appear on Netflix after they air on Hasbro's cable channel, The Hub. But for those of us who watched weekday-afternoon cartoons during the 1980s, the big news was that the Netflix/Hasbro pact also included the original "Transformers" (before Michael Bay got his grubby hands on it), "G.I. Joe: A Real American Hero" (before Stephen Sommers did the same) and "Jem and the Holograms" (which no one has yet turned into a terrible live-action movie). All three '80s classics will join Netflix's lineup later this year. These shows are the forbidden fruit of children's programming. All were very popular in their day and built followings that even now still support comic books, T-shirts, DVD collections and retro-'80s-style toys. And all were derided when they originally aired as "half-hour toy commercials" because they were all based on Hasbro's popular toy brands. Unfortunately, an unholy coalition of professional worriers, seeking to shield children from the twin bogeymen of commercialism and fantasy violence, agitated until Congress passed the Children's Television Act of 1990, which put restrictions on advertising during children's programming and mandated that broadcasters air more "educational" shows. The bottom line is the Children's Television Act made cartoons like "Transformers" and "G.I. Joe" less economically competitive in the brutally competitive world of TV syndication. And that's partly why afternoon television is now wall-to-wall TV psychologists, TV doctors and TV judges — who just happen to be exactly the sort of professional scolds who demanded the federal government take action against cartoon commercialism in the first place. If I didn't know better, I'd suspect that was the plan all along. But revenge, as the Klingons say, is a dish best served cold. Today, Hasbro has its own cable channel, which is exempt from the rules that plague over-the-air broadcasters. So, Hasbro can produce new "My Little Pony" cartoons and sell My Little Pony ponies to the Bronies, and there's not much the killjoys at the Campaign for a Commercial-Free Childhood can do except mutter to themselves as they hand wash their Chairman Mao T-shirts — brand loyalty for commies. And for those of us who refuse to pay another $50 a month to upgrade to the channel tier that includes The Hub, there's now Netflix, where the childhood Congress stole from us lives again. Jack Nicholson hiding behind his hands as he struggles to stay composed is the most emotionally honest sight I've seen in a movie this year. That moment of truth comes in Alex Stapleton's heartfelt new documentary "Corman's World: Exploits of a Hollywood Rebel." For the first decade of Nicholson's career, producer/director Roger Corman was the future star's one source of steady work, both as an actor and as a screenwriter. And despite taking a few good-natured jabs at the films they made together — Nicholson says Corman occasionally made a good movie "by mistake," but he wasn't in any of them — Jack clearly has a lot of love and respect for his old mentor. The rest of Hollywood has rarely felt the same, forcing the soft-spoken Corman to become its most unlikely rebel, forging a successful career that is even more notable for the other careers it launched. Stapleton's film doesn't make the — admittedly grandiose — comparison, but Corman comes across as a Moses-like figure: He led others to the Promised Land but couldn't enter himself. 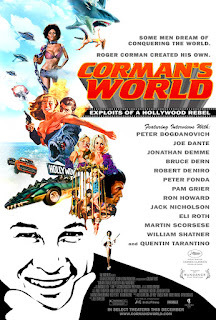 "Corman's World" is that story. When he didn't get the credit he thought was his due for helping bring 20th Century Fox's "The Gunfighter" to the screen — he was an uncredited story editor on the picture, which was a hit for Fox — Corman decided he would produce and direct his own movies. He developed a method that included shooting fast, shooting cheap and avoiding hassles like getting the proper permits. From outward appearances, Corman is the least likely guerrilla filmmaker ever, yet he became the most successful. He produced films on his own and, when he needed larger budgets, with American International Pictures, which released Corman's best works. Corman has never been a darling of critics. Some of his earliest films even he will admit aren't very good. But the Edgar Allan Poe movies he made with Vincent Price stand with the best horror movies of their day, and Martin Scorsese, who got his start directing "Boxcar Bertha" for Corman, holds up the 1967 LSD film "The Trip," starring Peter Fonda, Bruce Dern and Dennis Hopper, has a worthy effort. Corman's reputation today is largely the product of the directors, screenwriters and actors who learned their craft on Corman's sets. Many in the generation that reinvented the movies in the late '60s and early '70s — Scorsese, Fonda, Hopper, Nicholson, Robert De Niro, Peter Bogdanovich, Francis Ford Coppola — got their start with Corman. But Corman himself could never make the leap to mainstream respectability. His one stab at it was 1962's "The Intruder" — William Shatner's first lead film role. Unfortunately, this blunt look at race relations in the South was too controversial. "The Intruder" became Corman's one flop. He'd never make that mistake again. Despite once saying he was "almost" a communist, Corman succeeded as the ultimate movie-making capitalist. His audience — his customers — were always right. The judgment of the market is the only authority Corman really respects. All other authorities are oppressors to be challenged or at least circumvented. Today, despite finally receiving an honorary Oscar, Corman still works on the fringes, producing a somewhat lower class of B movies to sell to what used to be called the Sci-Fi Channel. Meanwhile, the movies that fill the multiplexes are the kind of movies Corman used to make — only with bigger budgets. It's Corman's world after all.